This is my finished kitchen - woo hoo! 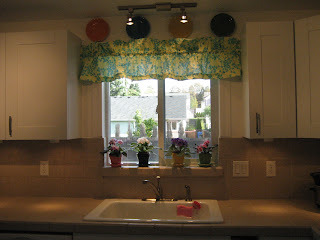 New cabinets, track lights, tile, over the range microwave, sink, faucet, kitchen valance (that I made myself with Amy Butler fabric), fiesta ware plates that my husband was kind enough to hang for me on the wall (above the window), new colorful flower pots... I'm STOCKED! Absolutely MAAAvelous! Very pretty, the lighting fixtures are great and I love all the white. Very nice!! 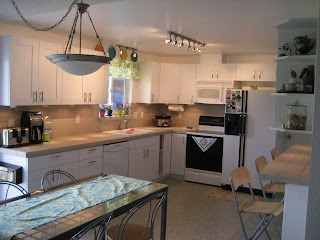 My kitchen was so dark before, now that's mostly white it seems so much bigger.